Suppose you have to create a report. You will definitely refer various sources to collect the information regarding the topic of your report. When you create your report, you may put some information that you have referred from some other source. So you need to mention the source there, from where you have referred this stuff. Citation represents the source from where you have referred this information. The Citation is placed inline within the text which you have referred from the other source. Citations are useful to create a Bibliography list. 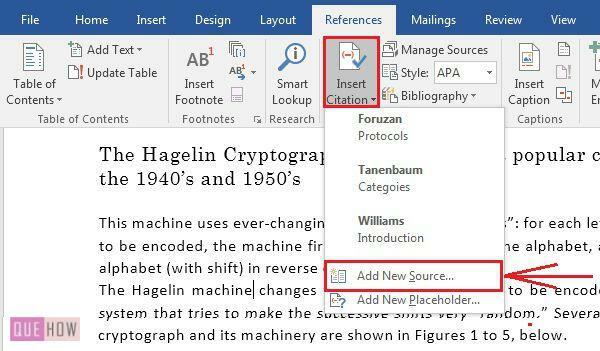 So let’s start with How to Create Insert and Update Citation in MS Word 2016? Step 1: In the image below you can see that I want to insert the citation after the text Hagelin machine. So, first, go to References tab. 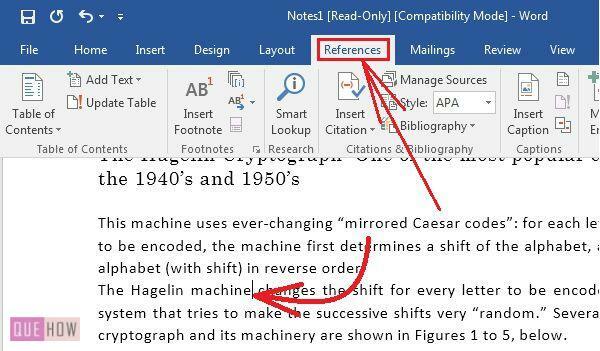 Step 2: Under References tab, in Citation and Bibliography group you have an Insert Citation button click it. When you will click Insert Citation button, it will show you already created citations. You can select any one citation among the list. But, if you want to create a new citation, click on Add New Source tab under Insert Citation button. Step 3: A Source dialog box will pop out. At the top, you have a Type of Source drop down box. Here you can select the source from where you are referring your citation i.e. from Journal Article, or a Periodical, or Report, or website, or a document in a website, or a book, or a section of a book, or a film, or interview, or miscellaneous. Step 4: The Type of Source you select will decide the Bibliography fields for APA. You have to fill the details asked in Bibliography Fields and click OK. Step 5: Now to insert the citation, first click the place in the text where you want to insert the citation and then go to Insert Citation button. Again it will show you the list of already created citations. Select and click the citation you want to insert. Step 6: In the image below you can see the citation is inserted after the text Hagelin machine. Whenever you click on this citation text, it will show you the drop down arrow. If you click that drop down arrow, a menu will open asking you whether you want to edit the Citation or the Source of citation, or you want to convert citation to static text or update Citation and Bibliography. 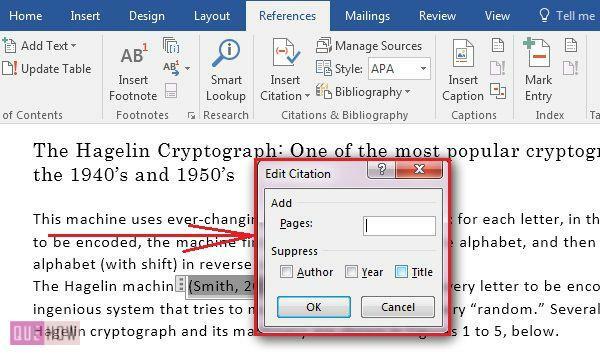 Step 7: For editing citation Click on Edit Citation. An Edit Citation dialog box will be opened. Under Add, you have Pages fill box, fill the page number where you have mentioned this citation. 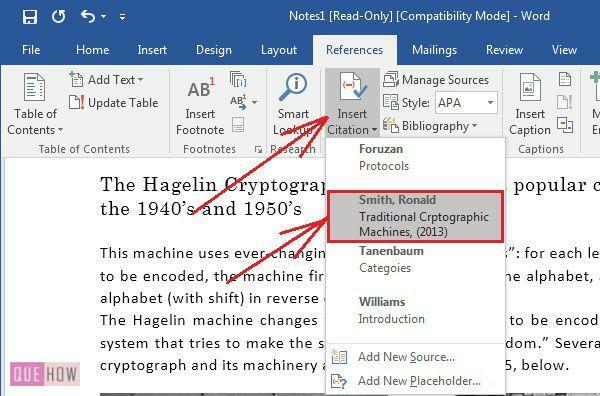 Under Suppress you can suppress the name of Author, Year, Title that is appearing in the citation text. Step 8: For editing source Click on Edit Source or you can also edit the source from the Manage Source tab Under Citation and Bibliography group of References tab. Both the options will take you to Edit Source dialog box. Change the fields you want to and click OK. That’s all. How to Create Cross-reference in MS Word 2016? How to Insert Symbols in MS Word 2016? How to Insert Clickable Checkbox in MS Word 2016? How to Create or Delete Bookmark in MS Word 2016? How to insert PDF into Word How to Add/Insert Sound in PowerPoint Presentation 2016 How to use Mail Merge in MS Word 2016? How to Create a Drop-Down List in MS Excel 2016? How to Delete Macro in MS Excel 2016?